Well, Sony is a creative company and always come out the innovative product. Few days ago , the newly announced product in Japan has became the hot topic on the web again, what is it? 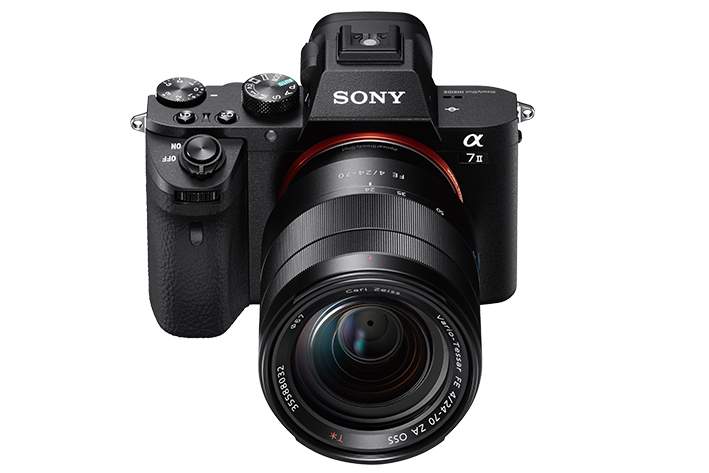 It is the new Sony Mirrorless Full-frame camera A7 II! Why is it so hot debuting this time? It is because it finally comes out with a function that everyone is dreaming of – the 5-axis in-body image stabilization! That’s watch the official video first. The new 5-axis in-body is claimed to provide up to 4.5 stop of image stabilization, and it means the lens can be build without image stabilizer hence the lens can be smaller and cheaper. When attach a lens with in-lens image stabilizer, the A7II will optimize the stabilization mechanism to fully utilize both in-lens and in-body image stabilizer. Surprisingly, the new A7 II is made of magnesium alloy body and we may expect it as robust as the current A7S and A7R. Few months ago, the A7 and A7s were found to have light bleeding issues during long exposure due to the mount component issue, the new A7 II now comes with a robust lens mount that can better support large and heavy lenses, and it is believed to address the light bleeding issue as well. Sony has refined the grip on A7 II, and reallocate the shutter button and the front dial to the more ergonomically location. The video recording format is upgraded to the pro-quality XAVC S format with the S-Log2 gamma setting that we have seen on the A7S too. However, the A7 II is capable to record at Full HD instead of the 4K as the A7S. The A7 II has the new Hybrid AF system that is 30% faster than its predecessor, and it can shoot up to 5fps continuous AF/AE shooting with better focusing. The A7 II is being sell at 189,880 yen in Japan and not available to other country yet. It is about USD 1,600 or SGD 2,100 by the currency conversion rate at the writing time. Although it is not available outside of Japan, but Sony Singapore is having the instant cash rebate of SGD 400 promotion on the current A7 model and the promotion is valid until 26 Nov 2014. Would you go and grab the A7 now with the great discounted price (SGD 1,599 for A7 body only and SGD1,999 for A7 with SEL2870 kit lens after SGD400 instant cash rebate) or waiting for the new A7 II? Cheers. Updated: Sony Singapore is having Sony Days 2014 from 27 Nov 2014 to 04 January 2015, A7 has 20% discount currently while the A7R and A7S have 10% discount.